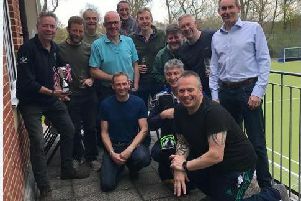 Chichester Falcons completed a season double over Baffins Brewers with a resounding win in the sunshine at Oaklands Park. Once again it was the first innings which defined the game as the Falcons shut out the Brewers at the top and hit 14 runs at the bottom, including a home run for Dave Piesse and two singles for junior Bronte Harvey. The Brewers knuckled down in the second and third innings, restricting the Falcons to three runs, coming via a single from shortstop Ben Sawkins and Stefan Panayotopoulos’ first home run. The Falcons continued to field well thanks to some deft work on the bases from Vicki Cathie and Lucy Morris, while Clive Janes made a running catch in centre left to finish up the second. With the Falcons 17-6 up already, Ally Warr clubbed a hit deep to centre field, sending pitcher Jason Mercer off from first base to third. Mercer showed determination and decided to dash in to score, forcing an error on the throw to home from the Brewers, enabling Warr to pick up her second home run of the season. A two-RBI single from catcher Louise Rowe eventually put the Falcons 26-6 ahead to end the game early in the 5th inning.